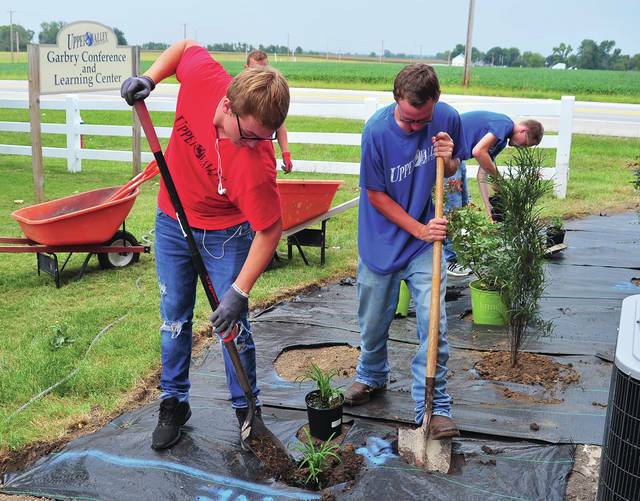 Braeden Snider, left, Matt Herron, right, and Shane Smith, back right, plant shrubs and flowers at the Upper Valley Career Center Adult Division Offices, the former home of Scott Garbry, on Thursday. Students from the Horticulture and Landscape Management course at the Upper Valley Career Center worked with professional landscaper Tom Lillicrap of Lillicrap Timber and Mulch on the project. Snider and Smith are from Troy. Herron is from Piqua. https://www.dailycall.com/wp-content/uploads/sites/30/2018/09/web1_090618mju_uvcc_garbrylandscaping.jpgBraeden Snider, left, Matt Herron, right, and Shane Smith, back right, plant shrubs and flowers at the Upper Valley Career Center Adult Division Offices, the former home of Scott Garbry, on Thursday. Students from the Horticulture and Landscape Management course at the Upper Valley Career Center worked with professional landscaper Tom Lillicrap of Lillicrap Timber and Mulch on the project. Snider and Smith are from Troy. Herron is from Piqua.